The PD-4012 Security Gateway Appliance can be configured as a firewall, LAN or WAN router, VPN appliance, DHCP Server, DNS Server, and IDS/IPS with optional packages to deliver a high performance, high throughput front-line security architecture at an excellent price in a compact footprint. 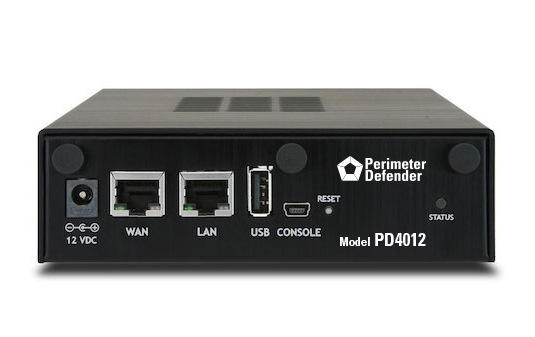 With preloaded Perimeter Defender software, the PD-4012 is a fast networking security solution unencumbered by traditional annual contracts, licensing fees, or artificial limitations. Flexibility is built in to the PD-4012 with upgrade options such as a m.2 SATA SSD or optional Wi-Fi. Perimeter Defender is a leading security software provider in design, engineering, and manufacturing services for advanced network appliances.